November 22nd, 1963 is a day that all Americans will never forget – the assassination of the 35th President of the United States, John Fitzgerald Kennedy in downtown Dallas. Those who witnessed his death, and the generations to come after, remember not only the legacy he left behind, but an iconic man who lead the American people through the Civil Rights Movement, the Space Race, and the establishment of the Peace Corps (just to name a few). 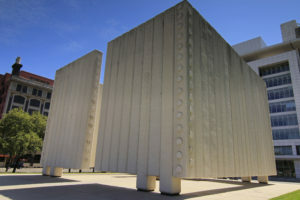 With the untimely death of a historic figure, each year the Sixth Floor Museum at Dealey Plaza, located within the historic West End district, holds an exhibit and event in remembrance, along with their daily tours. The Museum presents programs that allow visitors to explore specific aspects of the history of the Kennedy presidency and assassination, providing deeper engagement with personal stories and experiences. For all Texans and Americans, remembering President Kennedy in downtown Dallas brings together the community and enriches and teaches visitors as they come to learn more. The Texas School Book Depository was the branch office for sales, manufacturing and distribution for John Sexton & Co. Sexton Foods in the South and Southwest until 1961. In 1963, the building was in use as a multi-floor warehouse for the storage of school textbooks and related materials and an order-fulfillment center by the Texas School Book Depository Company. After a long decade of development and the downtown Dallas and historic West End community reactions, on Presidents Day in 1989, The Sixth Floor Exhibit opened as a response to the many visitors who come to Dealey Plaza and downtown Dallas to learn more about the assassination. The historical exhibition on the sixth floor highlights the impact of Kennedy’s death on the nation and the world. Two key areas on the sixth floor were restored to their original 1963 appearance. Twenty-Six Seconds, An Evening With Alexandra Zapruder, is the event for the 53rd anniversary of the assassination in downtown Dallas. The granddaughter of Abraham Zapruder, who famously shot the 26-second long clip of President Kennedy and his motorcade passing through the West End’s Dealey Plaza, Alexandra delves into the history and controversy surrounding her grandfathers famous ‘film’. Zapruder shows how that 26-second clip changed American history, the Kennedy family, and raised very important social and political questions that are still be asked today. Every year, some 350,000 people continue to visit the former Texas School Book Depository building – home to The Sixth Floor Museum at Dealey Plaza – to remember and reflect on the events of November 22nd, 1963. The West End is honored to share a piece of American history with downtown Dallas and the rest of the nation. For visitors and natives, The Sixth Floor Museum and their program dedicated on that historic day will be a must-see event.